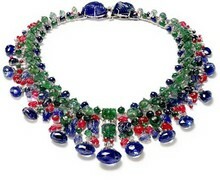 French jeweler Cartier opened its first American storefront in New York City in 1909. Since then, the name has become synonymous with glamour, money, and affluence. Worn by the likes of Elizabeth Taylor and Princess Grace of Monaco, Cartier’s jewelry evokes images of the perfectly tailored suits and elegant gowns of movie stars, royalty, and society women. The timepieces of Cartier were sported by Franklin D. Roosevelt, Fred Astaire, and Marion Davies. Cartier became the official purveyor to kings of England, Spain, Egypt, Portugal, Russia, Siam, Serbia, and Belgium. 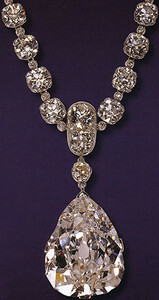 Pierre Cartier, grandson to founder Louise-Francois Cartier, even set and sold the world-famous Hope Diamond to American Evalyn Walsh-McLean. So, you can only imagine what delights await audiences at the Legion of Honor’s Cartier and America exhibition. On display are over two hundred of the most exquisite objects in existence, all designed by Cartier over the last one hundred years. Brooches, clocks, earrings, necklaces, tiaras, figurines, cigarette and vanity cases, bracelets, and rings all display glittering stones in intricate configurations, splashes of bold color, animal motifs, and magnificent artistry and craftsmanship. This exhibition is truly delectable. The pieces range in style from the bold, sleek geometry of the Art Deco period to the stylish simplicity of the 30s and 40s to the bright, chunky gold concoctions of the 50s that became popular again in the 80s. The jewelry is absolutely breathtaking — you are unlikely to find a more magnificent display of giant sparkling gems anywhere. In the early 20th century, the United States had a large number not only of affluent families, but also of young heiresses married to various royalty around the world. As a result, many exquisite (and today utterly impractical) pieces were commissioned from Cartier, such as the stunning bandeau formerly owned by Doris Duke. This spectacular hair ornament is composed of a repeating geometric pattern of diamonds crowned with two pear-cut diamonds and a glowing white pearl. These days, only Miss America could get away with such a piece, but it lets us imagine the glamorous pre-Depression years when the affluent donned their furs and frequented night clubs and speakeasies. After the Depression, the new royalty — movie stars — became patrons of Cartier, commissioning and acquiring pieces of equal exorbitance. Elizabeth Taylor’s glorious ruby, diamond, and platinum set (earrings, necklace, and bracelet) given to her by Mike Todd in 1957 is on display, as are numerous pieces belonging to Grace Kelly, who ultimately became Princess of Monaco. Particularly dazzling are several pieces commissioned by the Mexican actress, Maria Felix. Her taste in jewelry is exceptionally bold, leading her to commission an immense serpent necklace. Composed of platinum, white gold, and 178.21 carats worth of diamonds, the serpent is not only a startling piece, it is also designed for comfort and wearability. It is fully articulated and its back is enameled rather than diamond-encrusted. In addition to the jewelry are the timepieces of Cartier, for which the company is perhaps best known. Among the collection of dainty diamond wristwatches and colorful and innovative desk clocks are the “mystery clocks.” These are truly amazing, built with a technology Cartier wished to remain secret, but it was ultimately revealed. What is remarkable — and what gives these clocks their name — is the fact that the hands seem suspended in the middle of a crystal face with no gears to move them. This technology was employed to build a number of clocks, many of which have a distinctly Oriental flavor — a style popular in the 1920s. These include a series of six “mystery clocks” designed after Shinto shrine gates, bold columns standing on either side of a crystal clock face that, like its hands, seems suspended in mid-air. In addition to the sleek cigarette cases and shimmering gemstones, some works would now perhaps be considered rather kitschy in flavor. The Snow White and the Seven Dwarfs charm bracelet, for instance, is more reminiscent of a Disneyland gift shop than a high-end jewelry store, while the Sioux and Squaw clip brooches feature orange faced Native American caricatures that are, well, rather odd-looking. As is the Cowboy Duck Brooch. Yet, these must have been wonderful novelties when they were made. This is an exhibition filled with glitter and dazzle, enormous gems and exquisite pieces that clearly show the American passion for shiny objects of both bold and delicate design. It is sure to satisfy even the most voracious of luxury-item appetites.